A few years ago I visited Angola for the first time. As we sometimes do, I made certain assumptions about what it would be like. One of my assumptions was that all of the signage in the capital, Luanda, would be in Portuguese and English. I was wrong, and my inability to read the signs made me think about what it might feel like if I couldn’t read at all. The longer I was in the country, and the more words I saw that I couldn’t understand, the more I realized that literacy is truly a gift that keeps on giving. On that note, I’d like to share four books with you that mean a lot to me. When Stephen Covey’s “The 7 Habits of Highly Effective People” was first published, I’m embarrassed to say that I resisted reading it. Everybody was raving about it, and I thought, “It can’t possibly be that good.” But when I eventually came around to it, about 10 years later, I regretted not reading it sooner. All seven habits are principles to live by, but two in particular had an enormous impact on me. The first is to begin with the end in mind. Whether it’s a crucial conversation, a project, a relationship, your studies, or an exercise regime, beginning with the end in mind helps you to focus on the goal. When I was young, I was sometimes a bit of a “Negative Nellie” (even I find that hard to believe now). Learning QBQ principles helped me to reframe the way that I perceived challenging situations. David Richo’s “When the Past Is Present: Healing the Emotional Wounds that Sabotage our Relationships” isn’t one of the best-known relationship books. But for someone like me, who’s had to work through immense trust issues, it’s priceless. Learning to trust again is a process, not an event. It helped me to understand why I sometimes seemed to fixate on unhappy past events. It also helped me to think differently about those events and the impact they had on me. I had the privilege of attending a lecture by the author, Dr Win Wenger, and he made a very big impression on me. To this day, his book The Einstein Factor: A Proven New Method for Increasing Your Intelligence is of my favorites. Even if you’re only mildly interested in the power of creative thinking, problem-solving, and increasing your learning capacity, it’s a must-read. Now that I’ve shared some of my favorite books, I’d like to ask you a question: do you appreciate the gift of literacy? Do you give yourself the gift of reading often enough? If you don’t, remember that you have the power to change it! Who knows how the course of your life might change by reading a good book? Q1. What pleasure does reading give you? @TwisterKW It feels like my own little world. Like going inside and hibernating for while, but at the same time, going beyond myself. @JenniferBulandr Reading can be a wonderful escape, a chance to recharge my batteries and an opportunity to learn more! Q2. How did you develop a love of books, if you have one? Many of our participants remembered a parent, teacher or librarian who encouraged them to read. So, if you have young ones around, please do the same! @JusChas My mom read to us each night. I remember it from age 4. She read with enthusiasm and as a character from the book, which made it exciting! I had amazing teachers and [U.S. kids’ TV show] “Reading Rainbow” was a massive trend when I was little. @J_Stephens_CPA Wish I could remember how that love of reading developed. My mom used to ground me by making me go outside and play – otherwise I would spend hours with books. Q3. Who shared a book with you when you were a child, and what was its effect? @GThakore My dad is very fond of reading. Even at 84 he keeps on forwarding me some books! @TwinkleTutoring Usually my grandad or dad. They used to enjoy it as much as me! Putting on different voices for different characters. Using intonation to build suspense, sadness, surprise. I would be transported into that world and it would help me sleep. Q4. Where, when, and in what format do you read? How does this affect your experience? Many of you still prefer hard copies, but you use e-readers or apps for convenience. @harrisonia I still love tangible-cover, printed books. E-books are great for the sake of quick access and portability. @MaryEllenGrom On air travel, using Kindle so I can swap between multiple titles. Beach, couch and car gets a hard copy. iPad for e-books. No matter the format – just READ! Q5. What place do books have in a world of YouTube, Twitter and instant news? @Ganesh_Sabari Books have the ability to cover a larger time period in one stretch. The time required to read it is decided by the reader’s ability to assimilate new information. @GodaraAR Books are peace of mind. Twitter and YouTube are fast-paced sources. Q6. What is the most life-changing book, work-related or otherwise, that you have read, and what was its effect? @ankitapoddar I was gifted “A Fine Balance” by Rohinton Mistry. It pushed me to think and revisit many beliefs. I loved it! @hrsanjaynegi “The Monk Who Sold His Ferrari” by @RobinSharma. Q7. What book do you pick up repeatedly for inspiration or ideas? It seems that some older books, such as “How to Win Friends and Influence People” by Dale Carnegie, are still very popular. @ShereesePubHlth “The Life-Changing Magic of Tidying Up” by Marie Kondō. @Midgie_MT One of the books (of several!) that I pick up repeatedly for inspiration is “The Universe Has Your Back: Transform Fear to Faith” by @GabbyBernstein, as it reminds me to trust. Also, anything from @BreneBrown. Q8. Which book have you not yet read that you really want to, or feel you ought to, one day, and why? @TheCraigKaye I generally like reading anything! I’m currently reading “IT” by @StephenKing and I’m sure this will pop up in a workshop in the future… hopefully not literally! @sittingpretty61 I want to read “The Immortalists” by Chloe Benjamin. Looks very sensational. Q9. What book would you recommend to someone you are mentoring? Q10. Please share one takeaway/lesson with us from one of your favorite books. @MicheleDD_MT The analogy of the trust bank account from Stephen Covey’s “The Speed of Trust” is imprinted in my mind. Are my words, behavior and actions adding to my trust account, or depleting it? To read all the tweets, have a look at the Wakelet collection of this chat. The term “psychological safety” was coined by Harvard Business School professor, Amy Edmondson. It’s the belief that you will not be punished or humiliated when you make a mistake, ask a question, come up with an idea, or voice a concern. 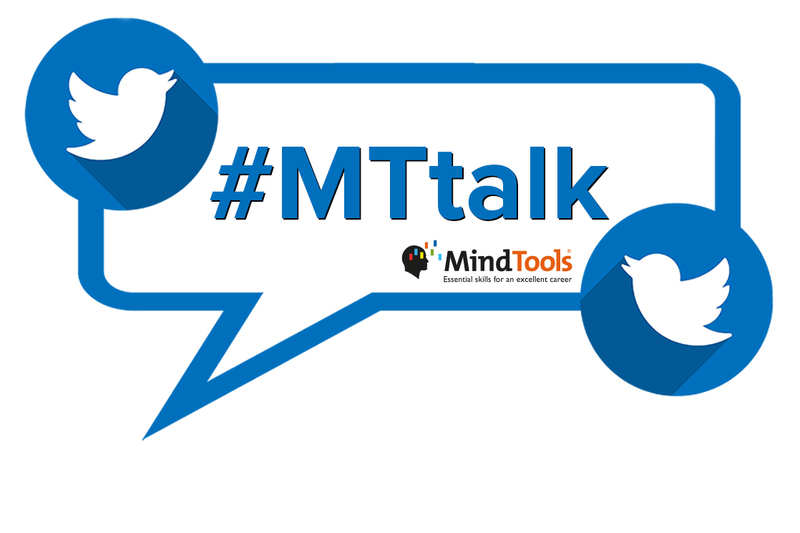 Next time on #MTtalk, we’re going to talk about psychological safety at work, and we’d like to know what you think will help to make your workplace psychologically safer. Click here to see all the options and to cast your vote. In the meantime, here are some resources that may help you to improve your reading skills.